Handicap saddles by Grays Custom Saddlery in Horseshoe Bend, Arkansas. I forgot to tell you all – I got something really cool a few weeks ago. 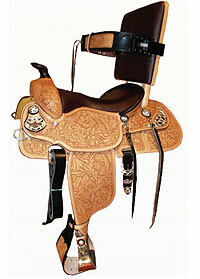 I think I mentioned that I had been using my friend Shari’s saddle for trail riding. It is just the nicest, most comfortable saddle you could ask for, but I couldn’t keep using hers because she kind of wanted to use it too. So I thought I’d check on eBay for Eli Miller saddles, and I found a few. One of them just happened to be near where we live, so that’s the one I went for, and I got it! So if you’re in the market for a really good saddle you intend to keep for a while, I highly recommend an Eli Miller/Henry Miller. I’ve seen them in our local tack shops and several online stores. And don’t forget eBay! Last weekend, we attended a major socio-economic event, a veritable cultural phenomenon: The World’s Longest Yard Sale. This thing stretches 630 miles along Highway 127 from Alabama to Ohio, and you can find just about anything there. Like regular old yard sales, most of it is junk. There are a few gems among the knickknacks, VCR tapes and 80’s posters, though, and we found a couple in our price range. Among other things, we got a hand-painted light switch cover; a John Deere hat; an “antique” concrete leveler; and a 17-year-old book about east Tennessee. My favorite buy of the day, though, is my new saddle. I’ve been borrowing my friend Shari’s saddle for over a year now, and wanted to give it back. We looked at saddles, but most were more than we wanted to pay. Then at the end of the day, at a stand that was selling lemonade, tomatoes and a mish-mash of junk, were two saddles under a table. One was just too worn-out to even consider, but the other was okay. It’s a dark brown western saddle with no silver (I’m not crazy about the silver) and brand-new stirrup leathers, and came with an extra strap and roping cinch. It’s pretty worn but not cracked or torn anywhere, and the tree (the rigid foundation that the saddle is built around, kind of like a car’s frame) is intact. Shari looked at it for me and said it’s okay, and that we didn’t get ripped off. The guy was asking $85; Bill, wonder-negotiator, got him down to $60! What a deal! See you next year at the World’s Longest Yard Sale! Okay, I spent several days comparing the picture in the catalog, the pictures we took of Valentine all tacked up when we met him, and every other picture of a horse with bridle on I could find, and decided that today was the day. I finally rode my horse, by myself. First, we had to remember how to put the saddle on. It took a long time, but I’m pretty confident we got that right. It stayed on the whole time, so that must be a good sign. The bridle was another story. I did the best I could, but I’m not confident at all that it was right. Valentine was so good and patient while I tried every combination with those straps that I could think of. I think he was annoyed by all the giggling, though. Once the bridle was looking as close to right as I could get it, and the bit was adjusted pretty well, we maneuvered Valentine over to the tack room, which has a foot-high step up, so I could get on. Then Bill led us out to the pasture, and it was time. Was that a wild ride! There are a few factors that came into play here. Valentine’s former owner hadn’t been riding him regularly, and we hadn’t ridden him at all in the month we had him. We were using tack that was all new to him. He is only 5 years old – a “teenager.” And, probably most importantly, I’m a total greenhorn and he knows it. So he spent the whole time I was on him trying to get me off. He ran under trees. He brushed up against the barn. He charged up to the barbed wire fence. He ran to the low point of the fence at the corner of our property, where I thought for a split second that he was going to jump it! He ignored every command but “whoa” and was slow to respond to that one. The good news is, nothing he tried worked. I managed to stay on the whole time, and didn’t get off until I was ready. We got a saddle today! A very nice person we know let us borrow a saddle. I can’t believe someone would be that nice. I love this place! She also came over and showed us how to put it on the horse, and made sure the stirrups were adjusted correctly for me. That was so thoughtful, I can forgive her comment that the stirrups were already in the right place for me because her kids had been using the saddle.